Dryer with Atmosphere Circulation S - LAC Asia Ltd. The LAC S dryer line is suitable for drying, vulcanization, preheating, curing of surface layers and modification of various materials in plastic, rubber, automotive, glass, ceramic and electric industries. The standard S design includes an HT 40AL controller with independent limit unit, K thermocouple, semiconductor non-contact switch relay, a door equipped with safety terminal switch and a stand. Benefits of the S line include long life of muffle with high mechanical and corrosion resistance, dynamic temperature curve regulation according to DIN 17052-1 and low power consumption. 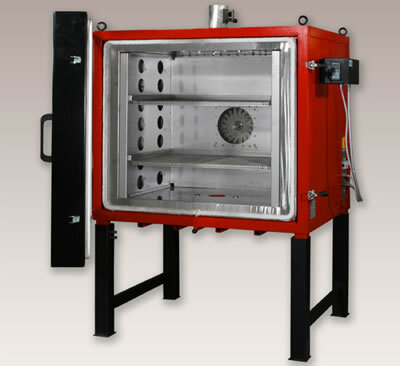 Drying, vulcanisation, preheating and curing; the S furnace line is also suitable for drying and curing of surface layers, and modifications of various materials in the plastics, rubber, automotive and electric industries, etc. The dryer's stainless steel muffle ensures long life, mechanical resistance and also corrosion resistance. Horizontal circulation of the internal atmosphere provides for even temperature distribution in the internal volume of the dryer. High-quality insulation material results in low dryer operating costs.